You’re probably here because the old yahoo finance query does not work in Excel anymore. As you can read in the updates section of my previous post How to: Obtain historical stock prices from Yahoo finance (you can query them via Excel too), the issue is Yahoo changing the URL and probably blocking Excel from accessing it. This post is going to focus in using another Yahoo service though building the URL to make the API call is different so better to start a new post. I’ll be doing a Part III regarding using Google instead. The key thing to note here is that though this will give us a treasure of information, we won’t have access to the historical data from what I can see. So go to Part III on how to use Google Finance if you need historical data. Important! Yahoo Finance API does not support all the stock symbols. 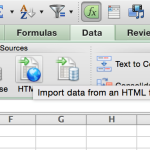 the last part (&e=.csv) seems redundant considering we are using quotes.csv so it seems like we can drop it. Hope this helps and Yahoo keeps it available for people to use around the world! Juan, have you posted Part III regarding the use of Goggle Finance? Sorry, not yet… work’s been hectic. This is an example URL but I need to dive in to see what other options are there besides date range: https://www.google.com/finance/historical?output=csv&q=AAPL&startdate=May+22%2C+2015&enddate=May+21%2C+2017. Hope this helps for now. Can you post a link example for a single equity (say:AAPL) historical daily base, including adjusted prices for a year? hmm does not seem to be working for India index and stock. I used ^NSEI and INFY.NS with l1 as (f). I am not getting any results. Thank you for the work you have done. I played with the Google site and didn’t see any options other than the date range. This issue I found with Google and this remaining Yahoo interface is won’t provide data on Mutual Funds. The Yahoo site that was shutdown did. Any thoughts on options if you want historical pricing on a Mutual Fund? Yes, you can use https://eodhistoricaldata.com/ they provide Mutual Funds historical data + adjusted closes for them. And actually, it’s easy to switch from Yahoo Finance to EOD. Because they have very similar API, and basically, you just need to change url from ichart.finance… to eodhistoricaldata.com. That’s easy! With regards to eodhistoricaldata.com on the yahoo blog there were individuals questioning the validity of this site. Questions were: site appeared right around yahoo interface termination; ownership of site; source of data. This site needs to clear up those questions before I would register with them. Eoddata has been around for several years. I used them for several years before I switched to to the Yahoo! Finance addin. I will be using them again. I am also checking EOD, but not sure how long their history is. EOD’s domain registered last year. For historic data I have created a VBA/Excel workaround, a function call which takes the old ichart URL, converts it into something that works then fetches the data. Go to signalsolver.com and follow the menu to EmulateURL. Its free.